ED: You write so beautifully about the notion of “the twilight” in history, the real stories of what happened, stories of women like Ada: “Ada’s war would be forgotten.” Do you think it’s a problem we still face, today? In the immediate aftermath of World War Two, the public narrative that prevailed in Britain was one of victory and valor and stories which did not conform to this template were often ignored, not listened to, or believed. The subjugation and imprisonment of British subjects was one such. Male prisoners of war held a heroic place as resisters and survivors in the narrative. But women? There is for the most part silence. Collaboration was another toxic theme. This was not the pressing issue in mainland Britain that it was in other parts of Europe, with the exception of the Channel Islands (although this remains contentious and controversial.) But I wanted to raise some of these questions in my novel: what happened to women subjugated by the enemy? How were they regarded? What is collaboration? What is choice under these circumstances? Where does gender sit in this murky arena? Women charged with collaboration in Europe (and in the Channel Islands) – usually for sleeping with the enemy – were regarded particularly harshly and often the victims of a brutal rough justice. The nature and forms of collaboration with an enemy may take many forms, gradations of co-operation which may have little or nothing to do with sympathies for the occupying power and much to do with survival. Equally, the ethics of resistance are not so clear-cut: how right is it to carry out an act of sabotage knowing that the reprisals would be savage? In the years following the war people were desperate to put the hardship and suffering behind them and look to the future. The political environment had also changed as the Cold War bifurcated the world bringing with it the potential for nuclear annihilation. These were cosmic issues of survival which contributed to an amnesia of the war. I think many writers of my generation, born during or just after the Second World War and growing up in its aftermath, are still trying to make sense of our lives and the turbulent century into which we were born. Other tales now are beginning to be told, which examine a more ambiguous and ambivalent past. This is a rich seam to mine. ED: The descriptions of Ada’s dressmaking—the fabrics, the draping, the details—are some of the most evocative moments in the book. Did you have to do much research, to capture this world so vividly? How did you go about envisioning those creations, and writing those scenes? MC: My grandmother was a seamstress and my mother, though not a professional, made her clothes, and mine, and taught me how to sew. I grew up imbibing the mechanics of dressmaking, and the qualities of fabric. One of my daughters is now a costume designer so I had another generation to advise me. Not much research was needed on the practical side! Animating material was pure invention, and a lot of fun. I used the internet for finding period fashions and coupled these with memories from a misspent adolescence watching old movies on TV from the 1930s and 1940s. But I wanted to give Ada depth, to suggest that her passion for dressmaking was more than a passion for finery. She was well aware of the transformative power of clothes, on herself and others. This also enabled a human link, woman to woman, across the political divide of war. Her anthropomorphising of fabric provided a foil to the denaturised world around her and a metaphor of survival in the midst of brutality and destruction. At the same time, it emphasised the human cost of adornments, the superficiality of the women who demanded these luxuries and their indifference to the plight of Ada and other exploited labour. ED: How much has this notion of class changed, from the England of then versus today? Britain’s class system was (and is) by no means monolithic. Rankings and gradations existed which were finely and acutely observed and class snobbery, often morally charged, could be found both within and across classes. Among the working class, this ranged from skilled workers and their families who lived comfortably, discreetly and ‘respectably,’ to the rough and tumble of casual and unemployed workers in sub-let rooms. The Poor Law (abolished in 1932) classified the working class into the ‘deserving’ and ‘undeserving.’ The Trade Unions, on the other hand, helped to instill pride in the working class and their institutions, to secure a living wage, and to ferment the demand for, and the practice of, democracy. Social disadvantage still exists, but ‘class’ as a concept has lost its political potency and its conceptual clarity. The discourse has changed, but attitudes remain morally charged. The ‘deserving’ or ‘respectable’ working-class are now lauded in the political rhetoric as ‘hard-working families’; the undeserving as ‘benefits scroungers.’ The reality is very different: low wages mean ‘in-work’ poverty. Many of those hard-working families rely on benefits to survive. The Trade Unions have been decimated. The so-called ‘scroungers’ are often mentally, physically or socially disabled, or live in regions where unemployment is endemic. Class, as a term or a concept, is rarely used either by politicians or social analysts, least of all as a banner of pride. Poverty still hits women the hardest and the social world seems a harsher, more cynical place. ED: For a woman like Ada, growing up in that era, were there many career options available to her? Was dressmaking a way to transcend class divisions, or would they ultimately have constrained her? The Borough Polytechnic Institute (now part of South Bank University) opened in 1892, offering training in trades, as well as classes in arts and sciences, literature and general knowledge. Elocution was also included in the syllabus. ED: Throughout most of The Dressmaker’s War, Ada Vaughan is tenacious in her ability to stay alive. But even after surviving Nazi imprisonment and wartime Europe, Ada is ultimately defeated by the justice system of her own country—unfairly, it seems! Why did they prosecute her so zealously? Would a woman like Ada have ever gotten a fair trail, at that time in England? MC: Ada did murder Stanley/Stanislaus. That was why she was prosecuted. Nowadays, a defense would plead extenuating circumstances and probably convict her of the lesser crime of manslaughter. But post-war Britain was a society divided by class, gender (and, increasingly, race.) The political and justice system reflected the prejudices of the time. Universal suffrage was secured in 1928, less than twenty years before the end of the Second World War. There was no gender equality. Parliament was dominated by men. Similarly, the judiciary. There were no women judges (the first was appointed in 1962), very few women lawyers. Women could sit on juries but there was a property qualification which in effect barred them, for few women owned or rented property in their own name. Furthermore, lawyers cost money and the poor could not pay for a good lawyer. The legal odds were stacked against Ada. So were the civil odds. Women who murder transgress social and gender norms. The cases of Edith Thompson, hung for murdering her husband in 1923, and Ruth Ellis, executed in 1955 for the murder of her lover are examples of what would now be considered gross miscarriages of justice. Ada’s abuse at the hands of Stanislaus was historic. Today, the court would have a more sympathetic understanding of the role of long-term abuse as a motive in murder, but then there was no such defense. Ada was sexually loose, which again transgressed acceptable behavior and would be enough to discredit her evidence. She was working class, in a society riddled with class division and snobbery. She was independent, at a time when women were being forced back into the home as part of the post-war drive to ‘normality’ and the reclamation of employment for discharged servicemen. Finally, the post-war narrative of victory had no tolerance for traitors, and stories of survival such as Ada’s blurred the lines between survival and collaboration. She became, in effect, a scapegoat. 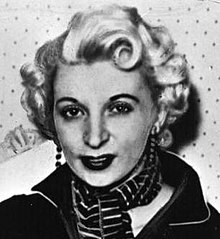 Ruth Ellis, the last woman to be executed in Britain, in 1955, for the murder of her lover, David Blakely. She had suffered violent abuse from him which was not taken into account at her trial, and was poorly represented by her legal team. ED: How did your background and knowledge of history inform the way you wrote The Dressmaker’s War? MC: South London seemed the natural location for my novel. My parents originated there and my childhood was filled with a repertoire of family stories set in the docks and markets, houses and streets of what they called the real London. I knew that historical and urban landscape, and its social topography. My academic specialism was the middle decades of the 20th century so setting my novel in that period came naturally, too. I am passionate about history ‘from below,’ so it was natural for me to make my character representative of two historically disenfranchised groups – the working-class and women. There are other communities too, passed over by historians for being the wrong race, gender, ethnicity, faith or sexuality, or the wrong side of struggle, so I do feel that history – and/or its ally, fiction – can help reclaim these hidden pasts. We need these correctives to enhance our understanding of the complex, varied, volatile and fragile social world we inhabit. Cleaning the pavement like this, in front of the threshold, was a mark of working class pride and respectability.